2015 was a big year for the steam early access program as two of its longest standing members, Kerbal Space Program and Prison Architect, finally made it out to release version 1.0. 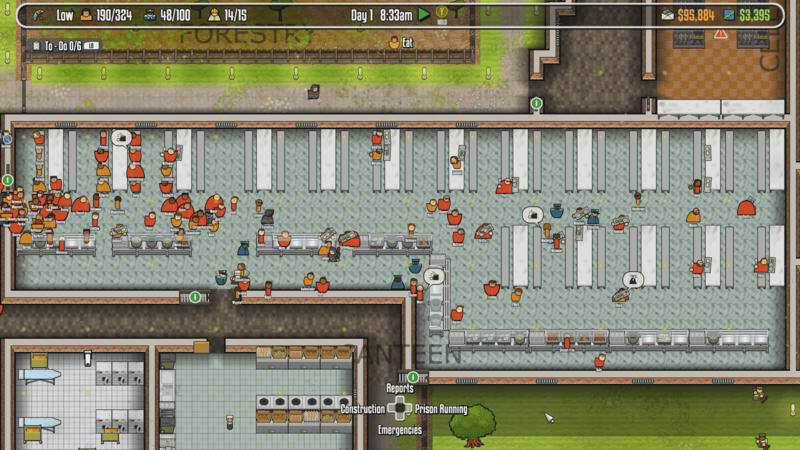 After breaking the mould both games are now scheduled to be released on consoles as well, and Prison Architect is the first one to land on one of the Next Gen platforms. Thanks to the new Xbox One early preview program, Prison Architect is now available on the console. Now I had purchased Prison Architect on PC when it was in beta, yet hardly played it until its official release date. But I very quickly fell in love with the game. So the minute it came to console I had to take a look. For those of you unfamiliar with Prison Architect it does what it says on the tin. You are left in charge of building and designing a prison and ultimately running it. From laying the foundations and the walls down to plumbing in the toilets you are in control of the entire prison. You can set your daily intake of prisoners in order to fill your facility. This is the main way to make money as you gain a little cash for each taken prisoner and more for the higher security ones. You can also accept grants which give you an objective to meet, such as building a medical wing and hiring some doctors, in return for a cash injection. But at the end of the day so long as your prison is profitable then you can build it however you like. Designing a prison is trickier than it sounds though. You need to keep your prisoners happy lest they riot on you. There is plenty that you can do in order to suppress your prisoners, so keeping them happy is quite a tricky task, especially when you’re trying to squeeze as many of them as possible into the space you have available to build. Cell quality is just the starting point. You need to think about their free time. Will they be spending it in the yard, in the common room or at educational classes that you have facilitated? 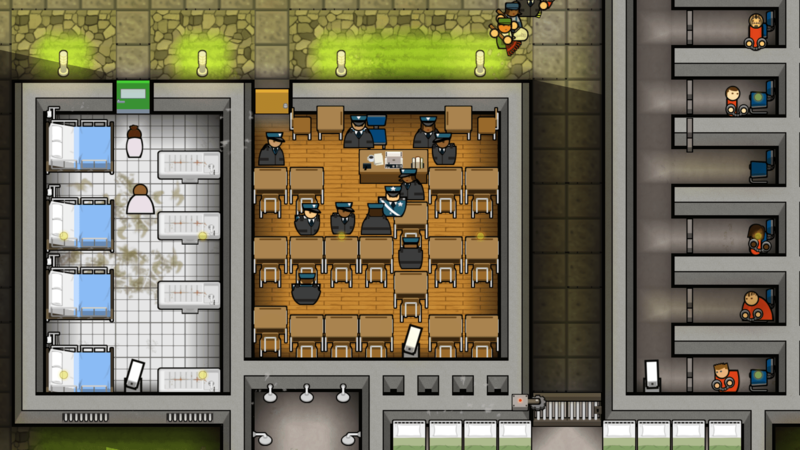 In Prison Architect you have to design a prison space that not only keeps the prisoners in, but that keeps the peace within the walls. Segregating the different types of prisoners, for example minimum security from maximum security, is highly advisable but can make logistics a bit trickier. All of a sudden you are building two canteens instead of one in order to keep prisoners separate. Prison architect is the type of simulation game that you would traditionally play on a PC. It’s well-known that mouse and keyboard is a much better control scheme for simulation games. However, Introversion Software have managed to create a control system that does a fairly good job on the console. Although the controllers joysticks are not as responsive as using a mouse, the UI on the Xbox version makes building and managing the process as easy as it is on the PC. In fact the UI in general is much more attractive on the Xbox One than it is on the PC version. Despite version 1.0 being released on the PC, that hasn’t slowed down the rolling out of updates from Introversion Software as we continue to see more updates from them on a regular basis. Just recently a gamer had discovered the hidden button that turned on a 3D mode in Prison Architect and, with their announcement recently in update video 5, the developers came clean on this feature. However, no such feature has been found in the Xbox One version to my knowledge. The one feature that the Xbox One version has over the PC version is the World of Wardens. 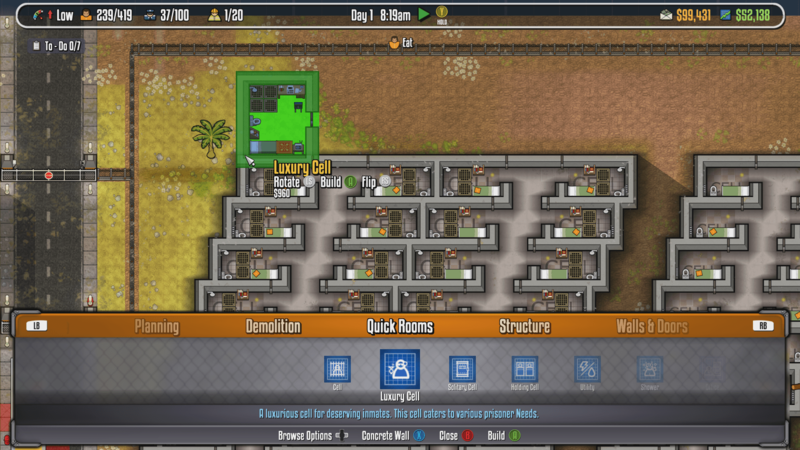 This mode allows Prison Architect players to share their prison designs, and for you to download and play them. When starting a new game you can choose either Prison Architect or Prison Warden. In the later you can select which prison you would like to start as a base, with each one showing you its size and design before you begin, but then allows you to jump straight in and play. I tested out the largest possible design that was available, The Forever Inn. It was a logistical nightmare, though at least everything was setup to get you going. You can still accept the grants in Prison Warden, and depending on the design these can unlock instantly. However, The Forever Inn is lacking a yard, which is part of the basic penitentiary grant. But in order to add a yard to the prison you need to find some space as the design really left none. Generally Prison Architect on the Xbox One run smoothly, however when I was testing the Forever Inn there were definitely slow downs. It was hardly surprisingly though with so many prisoners and such a large network of electricity and other cables. When I was first played in the preview version of Xbox One the World of Wardens feature was not available. I had speculated as to what it would be and to be an honest, sharing prisons was not one of my guesses. It is however an interesting feature. It’ll be interesting to see how long Prison Architect stays in the Xbox One preview program, considering how long it was available as an Alpha and then Beta under Steam Early access. There’s no question about it working on the console, Introversion Software have done a good job of that, and it’s nice to see that they are pushing the console version with new features and a separate UI from the PC version. If they can get the performance issues under control on the larger prisons then we’ll be looking at a quality simulation game that works on consoles.